The village of Sanogoan is a small settlement of Newar, the historical inhabitants of the Kathmandu valley. Sanogoan sits at the edge of Kathmandu Valley. It was entirely destroyed by the April 2015 earthquake. Most of its inhabitants currently live in tents and temporary shelters. ACT Alliance identified this village as a potential model village, in which different aid organizations belonging to ACT Alliance would provide all the services the village would need. The Lutheran World Federation coordinates re-building of permanent homes. 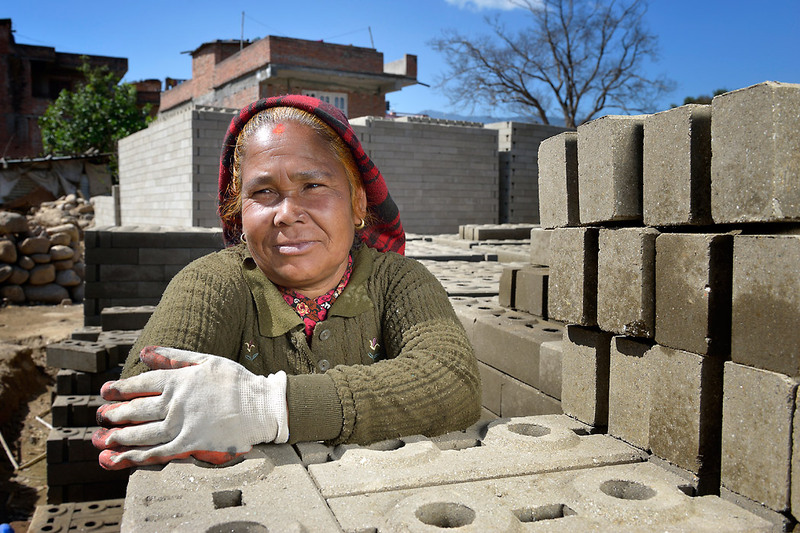 It has provided training in construction, as well as given tools and materials and is helping villagers form the tens of thousands of cement blocks they will need to build their new homes. Ramesh Shrestha shovels sand to make interlocking blocks, in Sanogoan, Nepal. She has wrapped a scarf around her head to protect her face from the dust. The bricks are made of sand, mud and cement. “When I first came women hardly spoke in meetings. The earthquake pushed them out of their comfort zone. The women are now quite vocal,” a LWF staff member observed. 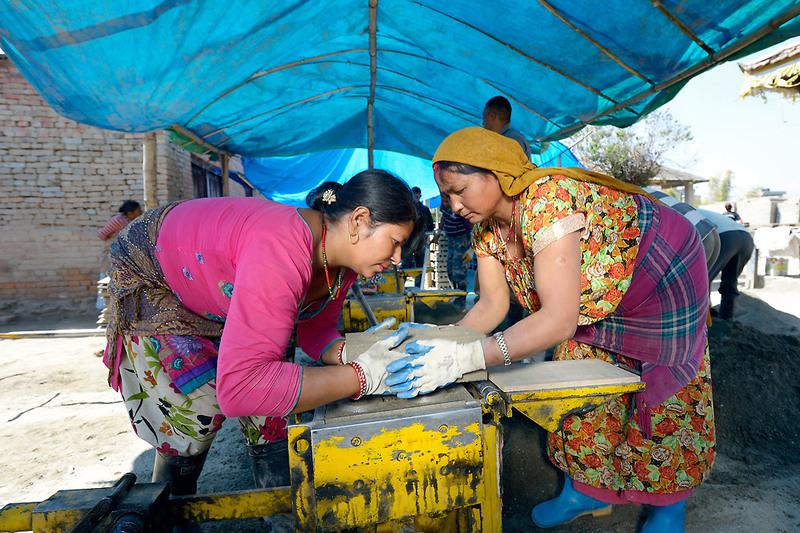 Amna Shrestha (left) and Saraswati Shrestha extract a cement block from a hand-operated press in Sanogoan, Nepal. 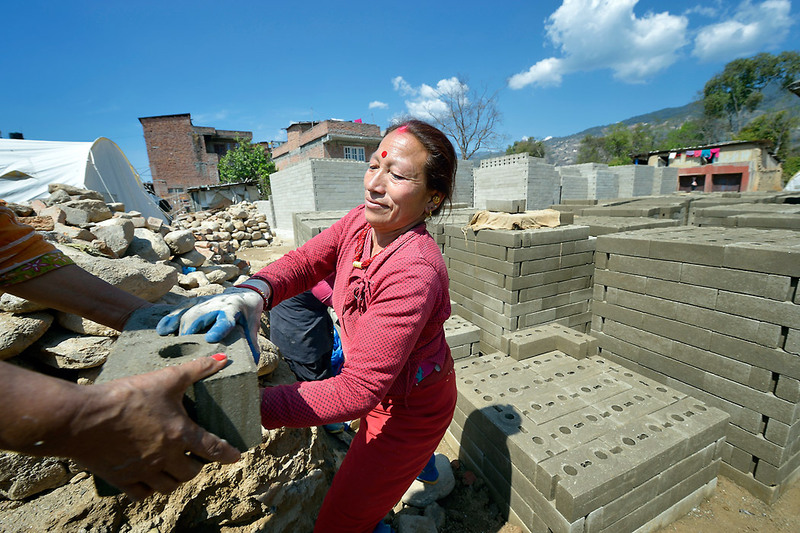 They and their neighbors will use the blocks to build new homes. Their homes were destroyed in the April 2015 earthquake that ravaged the Newar community, destroying almost all the homes in the village. The bricks are then left to dry in the sun or under tarpaulins. 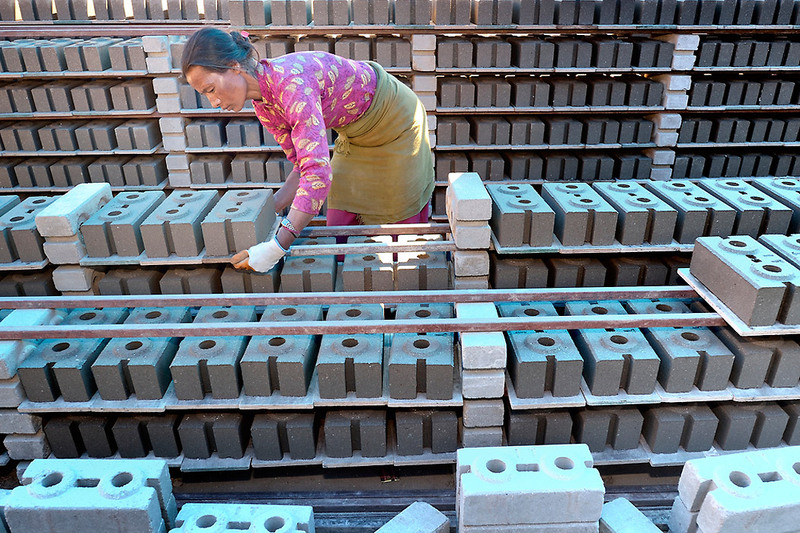 The women produced 80,000 bricks in three months. 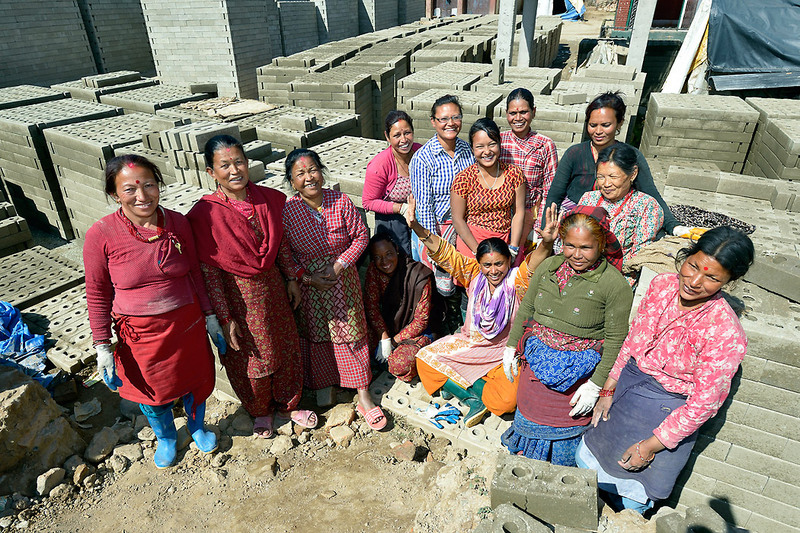 Some 200,000 bricks will be enough to build a ground floor for all families but the women plan to build two and a half storey houses. Women stack bricks. 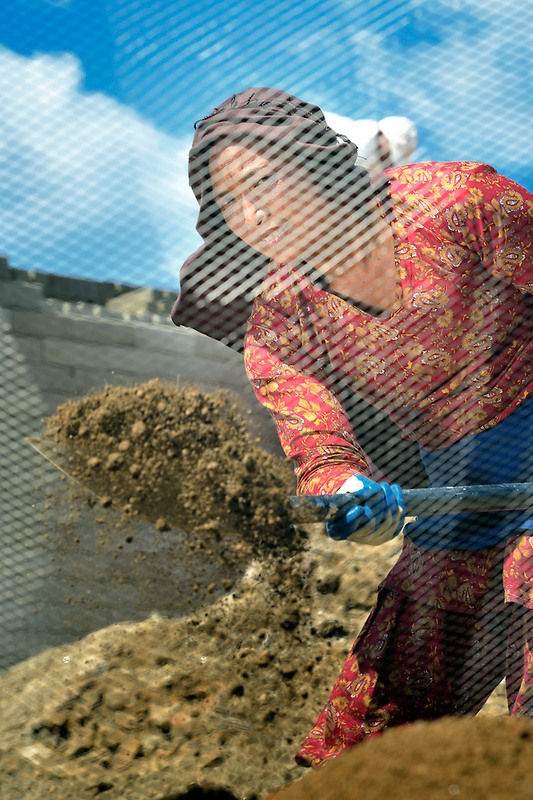 As a large number of men in the village work abroad, women lead the reconstruction work, effectively having two jobs. After a day of brick making, they return home to their usual load of housework. Kanchi Shresta helps stack the bricks. It is hard work. Each block weighs 9kg. “There is no way back. If we want to rebuild our homes, we must keep going,” they say. The women say the earthquake united them and forced them to brave the outside world and find their strength.